The rod wire should be bent about a small radius at 180°. By a bad lubrication of the wire in the bending tool shiny places, partly with material abrasion, could develop itself. 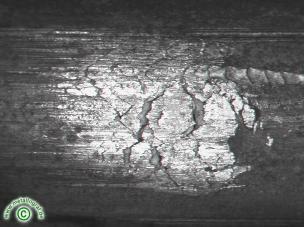 Small transverse cracks and friction martensite developed by the flow behavior influenced unfavorably. The arisen notching effect then led to the material break. The microstructure was judged as a well spheroidised annealing structure and didn't have influence on the material breaks.